Beautiful bathroom lighting for such a good price. The light is nice and bright for my hallway bathroom that my kids use. I also love the brushed nickel finish so it’s not too shiny. 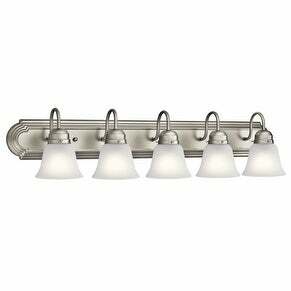 This 5-light bath/vanity light features a brushed nickel finish that will complement many traditional decors. Clean lines of the steel frame add interest while satin etched glass shades soften the light to create a warm ambiance for any bathroom or vanity space. These lights are the perfect fit for our new master bathroom. We have a very large space and bought two of these to place over the vanity mirrors. Nice fixture and we really like the look of these. Arrived with a dent in it. Returning it. "What size is the plate itself? I need something at least 5 inches deep so it fits over existing wall paper."